These photos are from a recent exhibition by Prism on at the RBSA (which has sadly now ended) but I wanted to share them none-the-less. Called ‘Another View’ it aimed to demonstrate just how broad Textiles can be and it delivered on that and some – it was both ingenious and thoughtful. Members of this Textile group are international but until now their exhibitions have been London-centric – and it was so refreshing to see Textiles on at the RBSA and to see such a considered, well curated, quality exhibition. 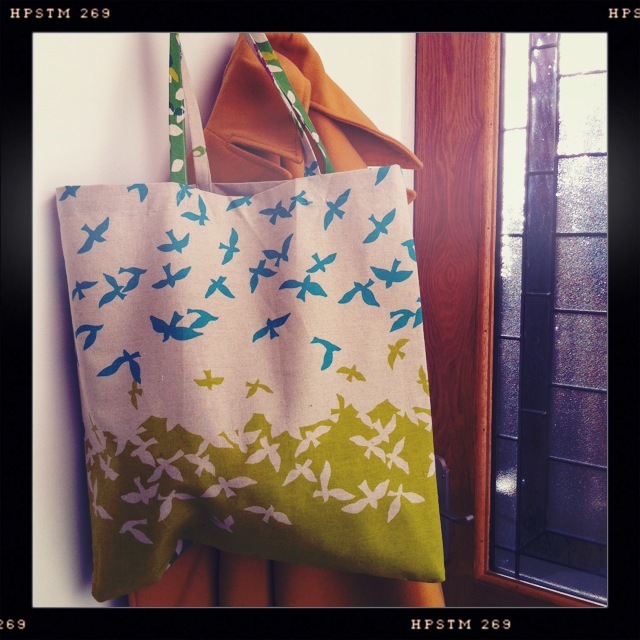 The range of applications was very wide but I am always drawn to colour, pattern, stitch and print. And the thought and development behind a lot of the pieces was very inspiring – lots of inspiration to be had. MAC Birmingham also has two Textile exhibitions running atm so it’s a good time to be a proud Birmingham textile-lover! Over the last few weeks I’ve been inspired to have a go at making a lampshade. It’s based upon the woods that we live opposite from and can see from our front windows and it’s also where we walk the dog everyday, so of course she features too! I began by measuring (and measuring again) and making a patchwork textile picture of the right proportions for the shade using colours to suggest the passing of the seasons and some of my favourite rare Liberty scraps. Then I lino-printed the trees on (regretted using a dark purple but it was too late) and then the fun and time-consuming part was to embellish it with embroidery. I tried to make the trees show the movement from Spring through to Summer and through to Winter as the shade curls around. I used French Knots for blossom, diamond-shaped leaves and couching with the bobbin thread. Still reflecting on what colour to keep the lamp base but I’m pleased to have tried this and it’ll be a whole lot easier now another time – watch this space! After along hiatus in painting activity around here, I have unpacked some lovely new paints and re-discovered my happy place. Inspired by our French holiday I have added some colour and warmth to my otherwise cold studio. I took delivery of a new sewing machine which is able to do free-motion machine embroidery – lots of fun ahead adding that to hand-prints and the like. And yesterday I allowed myself a moment of celebration when I saw the book I’m in on the shelf in my very own local Waterstones bookshop! Have a happy week everyone. I get to dream up lots of fun projects for kids and adults alike as part of my job at MAC which in turn challenges me to keep things fresh, re-visit techniques long forgotten or delve in and learn new ones. And as a part of my Mixed Media Textiles teaching, I played around with some potato printing which I hadn’t done for as long as I can remember. It’s often the simple, childish things that are the most fun to do but can be brought to a new level as an adult. One thing I’ve rediscovered is my love of drawing with threads – either by hand or free-machine stitching. It’s just another form of colouring in and mark-making. And all of that play has got developed into a one-day course Print, Sew, Make on Dec 15th where you can use simple fabric printing methods and stitch and leave with a drawstring bag if you like. There is a big gap forming between what I’m doing each day and the speed I get here to show it! I’ve been busy lately making fabric butterflies and moths for an upcoming MAC workshop. I’m loving the variety of work that teaching Textiles opens up. I have loads of photo reference from my trip here last year which has come in really handy. I love it when you follow your heart’s inspiration only to find things come together at a later date. And it’s interesting for me to see the marriage of painting and textiles coming about too on this project. BTW did you see my new website header sneak in! I have been having a lot of fun over the last few months teaching Mixed Media Textiles at MAC Birmingham. This is a fabric collage piece based on the lovely village of Marken in the Netherlands. The students are full of talent and creativity and sometimes it’s easier to show someone how they could approach their work, rather than explain it. So I have been using our Amsterdam trip as inspiration to re-aquaint myself with techniques and ways of working that I haven’t used recently while painting so as to make a sketchbook of samples. And boy have I had fun! And learnt some things long forgotten such as I love print, love using embroidery stitch to draw with, like trans foiling, like dying but still hate weaving – too slow! This past week I’ve been doing a little screen printing project at home. A little zippy bag for my soon-to-be aupairing girl. And the time and the weather gave us a chance to get into the garden this long weekend and sort it out a bit- the upside of which is finding flowers once hidden. And the opportunity to photograph socks freshly off the needles. The Fairisle flower was finished first. You can find it here but I added the toe pattern which has made them a little pointy – elf socks! And this wool I bought when Debbie Bliss came to our local knitting shop recently, bringing a discount day with her. I hope you’ve enjoyed your long holiday weekend too. What is it about Decembers approach and shorter darker days that seems to gobble up time and energy?! I intended to be back here much earlier in the week to tell you about the wonderful V and A Museum. I have loved that place since the first day I discovered it in my teens. It’s like getting a round-the-world ticket to visit every culture and museum under one roof – so much design inspiration from every corner of the globe. I had gone to see the Fabrics of India exhibition and I had taken a pen and paper because I so often come home with a book or some postcards and put them on the high teetering pile of ‘Future Inspiration’ but fail to get around to it. This time I thought I’d work while at the exhibition and cut out the lazy and forgetful stage and come home ready with some drawings to develop. And I’m glad I did because a) it was a no photos exhibition and b) there was so much to feast on. So you may ask where did all these photos come from? The answer being the Asian Art gallery that I just happened to duck into on the way. I so love Indian Miniature paintings – all the jewel colours, intricate patterns and the stories being told. And there is something about the embroidery which inspires me endlessly too although I would never want to embroider it – I’m too impatient! The exhibition is beautifully set out and the videos of fabric being made are fascinating – like watching a caterpillar farm (well mulberry silkworm) harvesting silk – now I understand why it’s so expensive. I’ll pop in again to show you my visit to the wonderful Borough market next. 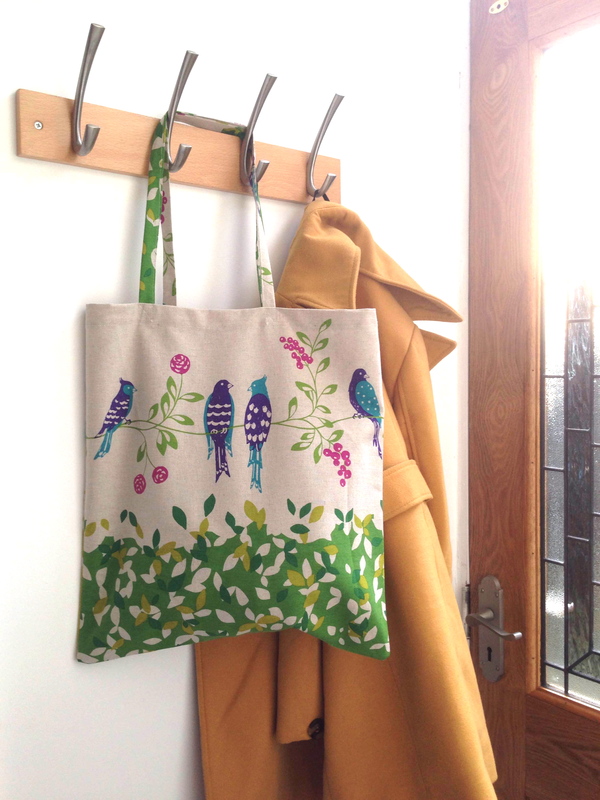 Just popping in today to show you what I knocked up at the weekend with a piece of Echino fabric that has been waiting for a special project for years and years – I decided to just cut it up and use it. Carpe diem! !